Asset Categories allow you to create an additional reporting level for your Assets. Categories are User-defined and allow you to group different Assets into specific categories for reporting and sorting purposes. Asset Categories can be created through the Setup Assistant, on the 'Asset Categories' step, or on the 'Fixed Assets' sub-menu in the top ribbon. On the 'Asset Categories' step, click the 'Add Category' button to open the New Asset Category prompt. Enter the Category Name, and optionally select the Employee that will maintain the Assets in the Category in the 'Service Employee' field. If you have a specific Vendor that performs service on the Assets in the Category you can select them in the 'Service Vendor' field. Save to complete the Category creation. Once you have created your Asset Categories, they will be available to select on the Asset Record. You can assign Asset Categories to Assets as you create them, or after they have been created. Assets can be assigned to one or several different Asset Categories. Click on the 'Categories' field on the Asset Record to display a multi-selector where you can click to assign each applicable Asset Category. 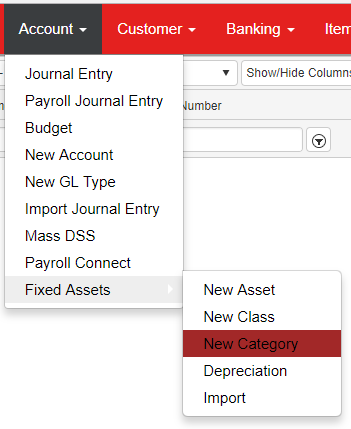 All existing Asset Categories will be listed in the 'Asset Categories' list in the 'Fixed Assets' subsection of the Accounting Module.